Back in the old days the “supers” were made by the beekeeper, during the winter when there was time and good native timber to work with. Over the years native timbers became scares and expensive whilst the change to Radiata pine was inevitable. The beekeeper's preference went out to “old-man” pine, large old pine from farms and woodlots, with high resin content. Dipped in paraffin wax these boxes lasted a reasonable time. Times changed yet again, there is little time for the modern beekeeper to spent time making boxes and as small mills and “old-man” pine are disappearing, good quality timber, for a good price, is difficult to get. To get “new-age” Radiata pine boxes to last longer, ways to preserve the timber have been developed. To date Tunnicliffe's have been supplying its products as kiln dried untreated Radiata pine or treated with bee friendly Tanalised® Ecowood. The treated version comes in treated wet or kiln dried. When referring to “treated timber” we more or less immediately associate this with using a cocktail of chemicals applied to timber. When we talk about chemicals we enter into a sensitive area to beekeepers, as the issue of contamination of honey is a real risk to their business. 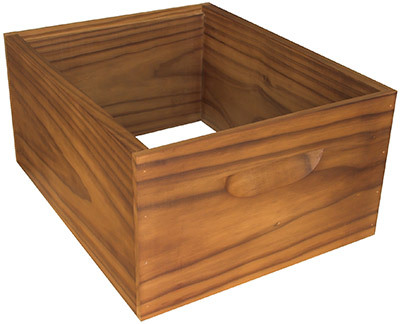 It is reasonable to assume that the majority of beekeeping wood-ware undergoes a treatment of some kind, especially beehive boxes, to make them last longer. There are several techniques ranging from painting only to dipping in a copper naphthenate solution, paraffin wax and using a vacuum pressure treatment process such as with bee friendly chemicals like Tanalised® Ecowood. When we say bee friendly, this means that the chemicals used are not killing the bees. But if it is safe for bees, the next question is as to whether it is safe for the honey. Tunnicliffe's believes it is, yet nowadays we have to deal with a perception in the market that looks less favourable at chemical treatment of bee wood-ware. Contamination of honey was thoroughly discussed during the 2008 NBA Conference in Dunedin. In fact, it triggered Tunnicliffe's to go ahead with an alternative it had been aware of for several years. You may say that we have come up with a revolutionary new product to help address the issue with regard to bee wood-ware. Tunnicliffe's has extended its beehive box range with a durable timber product, free of any chemical. The timber used is thermally modified NZ Radiata pine, which is comparable with naturally durable timbers such as Cypress Macrocarpa, Western Red Cedar and Redwood. Working with ThermoWood® is easy. It machines and finishes well. In general the timber can be nailed and screwed as with the untreated version, keeping in mind that it is a little more brittle. For nailing it is recommended to use a small pneumatic nail gun with adjustable drive depth. Self-tapping screws can be used without pre-drilling. Normal PVA, PU, MUF glues and RF resins can be used as well. ThermoWood® can be used unpainted for exterior use. However it will weather, turning grey as any other timber. It is recommended to seal the timber with at least one coat of paint to keep it in long lasting good condition.